Who ever said that knitters have to feel left out on Halloween? DIY Halloween costumes aren't just for sewists; there are plenty of inspiring patterns out there for those who are ready to pick up a pair of needles and some yarn. In this chilling collection, we've pulled together some of our favorite spooky knitting patterns for Halloween. Whether you're searching for a simple baby costume, an adult costume idea or a simple party decoration of an evening of howling-at-the-moon fun, this selection of DIY Halloween costumes and decorations has you covered. Looking for even more spooky knits? 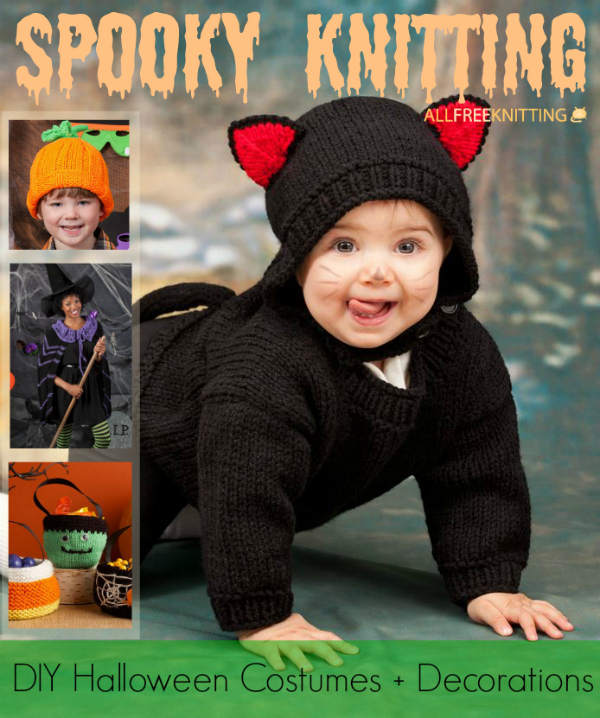 Be sure to check out our popular free eBook, 7 Free Knitting Patterns for Homemade Halloween Costumes and Easy Decorating Ideas! Dressing up babies in cute costumes has to be one of the best parts of Halloween -- if you're lucky enough to have a baby. From the large variety of baby costumes out there, we've narrowed it down to two essentials: the Cuddly Candy Corn Cocoon and the Baby Black Cat Costume. Halloween just wouldn't be the same without this staple, sugary treat and the iconic black cat. Cuddly Candy Corn Cocoon and Cap : People won't be able to help "oohing" and "aahing" when they see your little guy or gal dressed up in this easy costume. Just be warned: your baby will look cute enough to eat, which may tempt some to toss him or her into their treat baskets. Baby Black Cat Costume : This is the ideal costume for DIY-ers who are pressed for time and need access to a classic, but adorable, idea. Pair this easy knitting pattern with a painted nose and whiskers and your little one will be all ready for trick or treating. Perfect Pumpkin Hat - With sizing instructions for babies, kids, and adults, the Perfect Pumpkin Hat truly lives up to its name. If you're headed to a party this year, don't opt out for cheap store-bought costumes. Instead, whip up your own creative masterpiece using these patterns as your guide. From the sweet and innocent Red Riding Hood to a sinister-looking witch, this group of DIY Halloween costumes is made for even the spookiest of adult soirees. Red Riding Hood Cape : This cozy red capelet is stylish enough to wear all year round. Match it with a picnic basket and white dress to create a costume that everyone will be talking about. Gothic Witch Cape : For those who admire costumes that lean more on the dark side, this Gothic Witch Cape is just what you need. Wear it with a pointy hat and black dress for perfectly spooky combination. Spooky Hands Scarf : If full-on costumes aren't really your thing, check out this unusual accessory. Made with enlarged, striped hands at either end of the scarf, you'll turn heads walking down the street even without a complete costume! Spruce up the home for Halloween celebrations with these easy ideas below. Spooky Ghost Buddy : These stashbusters ghosts are great for both indoor and outdoor decorating. 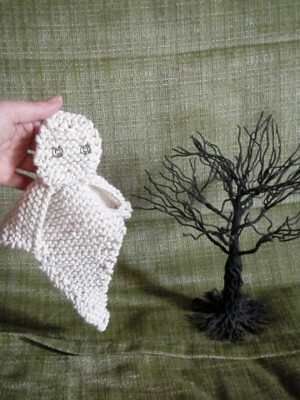 Attach a few to some string and hang them from the trees to create your own version of a haunted grave yard right in front of your house. Trick or Treat Bowl : Keep the trick or treaters in your neighborhood happy by stocking up this homemade bowl with their favorite sweet treats. Spooky Treat Bags - Add some spook to your sweets this Halloween with the Spooky Treat Bags. This ghoulish knitted bowl pattern features three different versions to choose from a scary spider motif, cute candy corn stripes, and a grinning green monster face.